Today, we’ll look at an amusing coincidence: how punctuation forms the basis of major money-raising campaigns in both Nxivm and Scientology. Why is punctuation so fascinating to cults, especially in an era where punctuation skills seem to be in steep decline in the world at large? Nxivm runs a program called Nxivm University. Internally, it’s known as “the Internship.” It takes two years to complete, and the list price for tuition is $120,000. 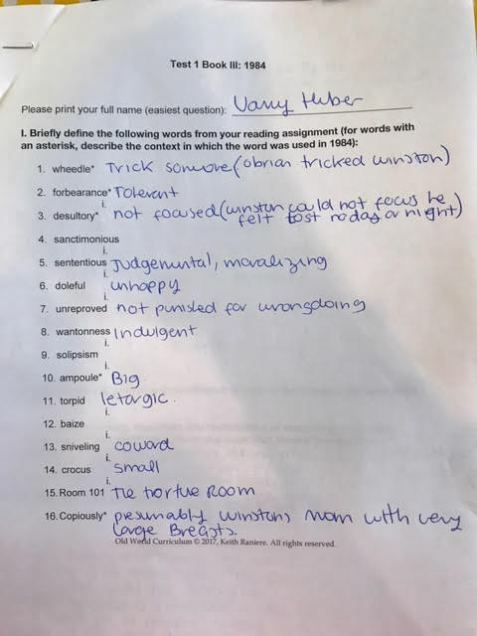 A lot of the material taught appears to be fairly pedestrian, often involving reading texts such as Ayn Rand’s “philosophy,” George Orwell’s 1984, and other materials most usually studied in middle school or high school. While Nxivm materials are often difficult to come by due to the group’s track record for litigating aggressively, leading critic site FrankReport.com posted two pages from one of the books used as well as two pages from a test on 1984, reproduced below. 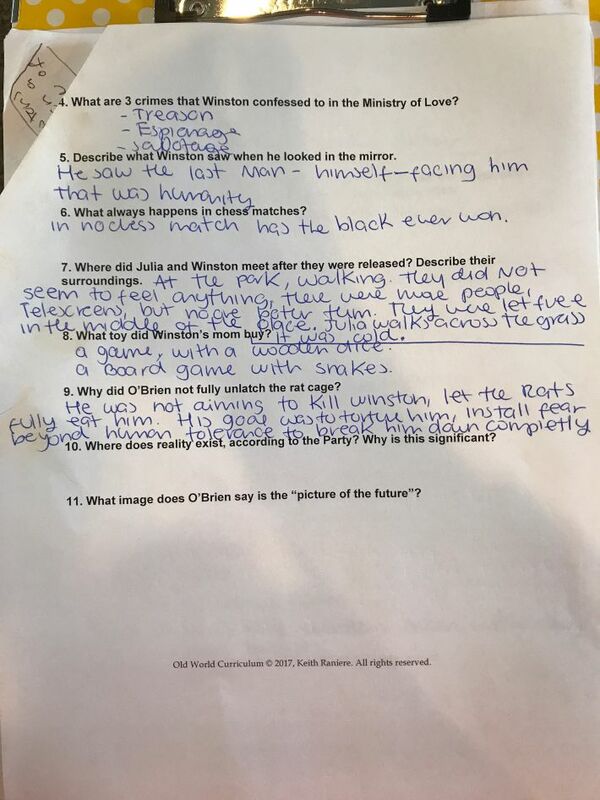 I checked with a friend who is a middle school social studies teacher, and she believes that this material is more age-appropriate for middle school than high school, and it is certainly beneath what one would expect to see at a selective university. So why would a cultic group like Nxivm focus on teaching punctuation to students? It is entirely possible that the arbitrary complexity of punctuation, taught in a setting of extreme pressure such as a course that costs a lot of money and where future status in the organization is determined, would create the kind of stress and self-doubt that cults need to engender in their members in order to provide a solution. Recall from academic works such as Margaret Singer’s Cults in Our Midst that a key part of the cult indoctrination and retention process is to get the recruit to doubt his own abilities, and then introduce through repeated examples the idea that the cult is the only solution to these exaggerated flaws. Strategically, the Nxivm University course appears to be a way to tie members more closely to the organization. This course is the key to becoming a staff member and potentially to earning money for signing people up for the group. Its high cost creates an enormous sunk cost bias, where people would have an enormous stake in staying with the program because of the money that they’ve already paid. This two-year apprenticeship, which is studied full-time, and which would probably require the member to relinquish full-time employment in the outside world, is perhaps one of the key loyalty tests that the organization gives, and represents a major boundary line in commitment to the organization. Early in 2018, Nxivm leadership upped the urgency for taking Nxivm University classes. In Nxivm, status is denoted not by the enormous gaudy certificates that Scientologists are awarded course completions, but by sashes of different colors that people wear at Nxivm events. The sashes have “stripes” added to them, denoting particular achievements within the larger rank denoted by the color of one’s sash. Management made it clear that the best way to graduate to the orange (“Proctor”) level is to graduate from Nxivm University. The former path, a series of “Ethos” classes, were only $300 per month versus the $5,000 per month under the new program. Nxivm has many “whales,” including scions of wealthy Mexican families, who could easily afford option #1, paying list price. The remaining discount programs are designed to trade cash off for increasing commitment to the organization. Option #2 gives a discount that the student will repay once selling Nxivm services such as coaching and courses. For those familiar with Scientology’s money-grubbing ways, it seems strange that an organization would offer such generous incentives to get members to sell other services. But a $60,000 discount on the course that requires the member to sell an additional $120,000 in services to pay off his tuition is an enormous challenge, one that could subject the member to significant pressure, especially if there are multiple graduates of this “Internship” chasing a relatively small number of paying members. While exact Nxivm numbers are much harder to find than Scientology membership data, we’ve previously estimated that there were about 1,000 active members before the New York Times story about the branding operation broke in late 2017 and many members defected. A reasonable estimate of revenue from courses and for commission dollars earned by members signing up others suggests it would be very difficult for the dozens of Nxivm University grads to generate enough commission dollars to fulfill this option of the agreement. Option #3 offers a “scholarship.” The referenced application form asks the member “What guarantees can you offer the company.” This is ominous in the wake of the revelation that cult leader Keith Raniere demanded “collateral” to keep the female members of his branded slave sub-group loyal to the group. We were unable to find out any information on how many people received scholarships or what sort of “guarantees” were in fact demanded in order to fund them. Of course, Option #4 is unlikely to be successfully used by anyone to get $120,000 in free tuition, as the chances of taking two novices with no prior exposure to Nxivm and signing them up for a two-year program at $120,000 apiece are indistinguishable from zero. 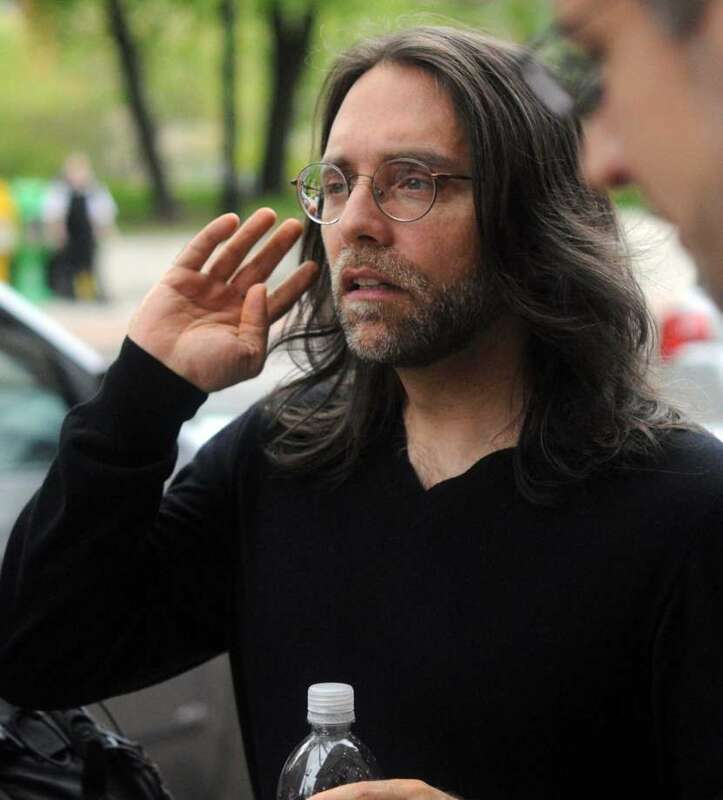 Interestingly, the gamified arrangement with different payment options betrays the roots of Nxivm founder Keith Raniere’s roots in the “multi-level marketing” world — before founding the cult, Raniere ran a company called “Consumer’s Buy Line” that was shut down by regulators as an illegal pyramid scheme. So what’s the connection between punctuation and Nxivm University? It’s pretty clear: punctuation is not really the point. It’s just grist for the mill, part of an assemblage of content that might make a good $20 Udemy video-based training class but that doesn’t really justify spending Ivy League tuition money. To the extent there’s any larger purpose behind studying punctuation versus anything else, it might be just that punctuation rules are sufficiently confusing and the stress of learning them in the context of an expensive “University” is such that it ends up making the student more dependent on the cult’s solutions for exaggerated failings. It’s very similar to the anxiety that studying Hubbard’s interminable mountains of drivel could induce in Scientologists, especially when they try to make sense of the updated and correctly punctuated drivel we’ll look at next. Scientology has had a major strategic problem since the 1986 death of founder L. Ron Hubbard: he was “Source,” author of the entire product line of Scientology. No one after him could create new “tech” to sell to members. But, of course, as longtime members climbed the “Bridge” and reached the highest levels, there was little else to sell them. Even the most die-hard Scientologists would eventually run out of things to buy. David Miscavige, who took over in a putsch after Hubbard’s demise, has pursued a two-pronged strategy. First, Scientology has focused increasingly on reaping donations, decoupling revenue from delivery of a specific product. The reward is not achieving all those super powers promised when you go “clear” or reach the OT levels, but trophies and status levels. For those who want to continue to pursue the “super powers” angle, Miscavige needed something to sell. He combed the archives and came up with an adaptation of the “Super Power” rundown, a comically contrived series of exercises designed to improve the 57 “perceptics” (which began with the five senses and claimed to also enable senses such as measuring the saline content of your own cells) which was originally designed to help recover burned-out staff. The facility for this was incorporated in the Super Power (now “Flag”) building completed in 2013 in Clearwater. The Super Power rundown likely costs around $30,000 plus accommodation costs, and total costs for someone who ends up required to get extensive auditing or sec checking before doing Super Power could easily spend double that. Miscavige thus needed a lower-cost new “product” to sell to his rank-and-file members who couldn’t afford to donate $100,000 and up for buildings and who didn’t have the cash for the Super Power rundown. Book sales were tapering off, and these are likely a key source of personal income to Miscavige. That’s because royalties on the books are paid through Author Services, Inc., a for-profit entity in the Scientology constellation. Miscavige was head of Author Services before he managed to overthrow Hubbard’s successors and take the reins of the cult. So reinvigorating book sales, which were flagging in the outside world was important, especially when Hubbard’s holy writ said that growing book sales was the key to recruitment. But Miscavige had a problem in implementing a book sale strategy. He couldn’t write new ones. Existing members, who had long been told that Hubbard was the only source of real Scientology “tech,” would not stand for anyone to create new material. Miscavige had to find a way to “freshen” the books without running afoul of orthodoxy that would force members to view anything truly new as heretical. So once again, the question: how does one lose tech? MISUNDERSTOODS. And whose were they? THE TRANSCRIPTIONISTS. Yes, you heard me: the transcriptionist’s. And here is what I mean. With a lecture, you hear LRH and the words he said. In a policy letter, you read them as he hand-wrote or typed them. Yet the books, with only one exception, were dictated. Meaning, he spoke them into a tape recorder and they were typed by a transcriptionist. You get LRH’s words as he or she relayed them, and when that person had a misunderstood, you get this: distortions, alterations and perversions, some little, some huge, but every one of them – a hang up for the reader, and that’s why I said you can look up every single word in one of these books and still not get it because when you track it out across the entire LRH library, you get such alterations as entirely missing chapters; total garbles; parts of the text specifically said to be deleted by LRH but left in anyway causing complete mystery; transcription errors whereby LRH dictates a sentence and then replaces it with another, but the transcriptionist was too lazy to go back and correct it leaving both sentences in the book. And if that’s not enough, take your “garden variety” transcription error where the typist isn’t sure whether they should punctuate with a period, colon, or a comma and in almost every instance deciding to go with a happy medium and using a semicolon – a total “maybe” and resulting in sentences, indeed paragraphs, where you don’t know where the sentence begins or ends. Now let’s add an editor, who instead of now correcting it decides to add his own clarifying footnotes to explain what LRH really meant or, through sloppiness, misplacing pages and lord knows what else – mixes up the chapters so some are not only in the wrong sequence, but entire chapters appear in the middle of another chapter, and that’s just the beginning of the list which explains why you’ll even if sometimes found LRH saying: “see later text” and yet the text never appears, or he refers to a process with a statement: “as described earlier” yet which never really did appear earlier, and if you don’t remember any of these examples from the books, that only makes my point – YOU WENT TOTALLY BLANK! So the fact that Hubbard was so boring proved that his genius works were corrupted by incompetents, and the new, properly-punctuated books would avoid the former health hazards of unconsciousness and worse. Of course, the more logical assumption is that Hubbard’s drivel put people to sleep because it was nonsensical, boring and poorly written in the first place to a degree that some punctuation re-work couldn’t possibly save. The resultant campaign to sell “The Basics” collection of Hubbard’s books and lectures at $3,000 the set, was one of the biggest sales initiatives in the history of Scientology. There are abundant reports of high-pressure sales tactics being used to get members to buy multiple copies that they won’t read. One campaign tried to get members to donate to send copies to large swaths of the approximately 120,000 libraries in the US. Of course, libraries who saw no call for Hubbard’s drivel didn’t want to devote space to his works, and the vast majority of these went straight from loading dock to recycling plant. Miscavige’s big lie about the punctuation issues in Hubbard’s works managed to thread the needle, at least on paper, of creating a seemingly new product with a compelling reason to buy without actually crossing the line and come up with something that’s not “on source.” At the same time, the approximately $100 million in revenue from the campaign fueled royalties for Author Services, and perhaps thus for Miscavige personally, in the amount of $15 million, at traditional hardcover book royalty rates. However, many people who left Scientology soon after The Basics campaign reported that the high pressure to buy, particularly to buy multiple unnecessary copies, was the critical breaking point that caused them to question Scientology and ultimately to leave. We find the implied contradiction in The Basics to be an even more damning indictment of Scientology “tech” than the high pressure sales campaign. It is a brittle technology indeed where the presence of several thousand mis-applied punctuation marks in dozens of books can so alter Hubbard’s meanings that it becomes dangerous to one’s health. One would think that the “tech” that its devotees can save the universe ought to be more resilient. People have worked from slightly different versions of the Christian bible for centuries and all seem to do OK. The Nxivm University program seems to have a much better strategic foundation than Scientology’s punctuation-powered program, one that uses founder Keith Raniere’s background in selling dubious multi-level marketing programs, to bind people more closely to the cult. The different payment programs suggest a flexibility to reach a broad cross-section of members, and to turn more advanced Nxivm students into staff members expanding the business. If there’s a problem in Nxivm’s model, it’s just that the group never got large enough for the number of sales people to have adequate financial support and to be able to grow the organization significantly. By comparison, Scientology’s “The Basics” campaign, fueled by a one-time revision of Hubbard’s drivel, was a disaster. The need to navigate a razor-thin path of positioning The Basics as something new and different, but not so new and different that it was no longer “on Source,” ended up being almost impossible to hit. While revenue was significant, it also produced a lot of former members, ultimately impacting the cult’s ability to generate future revenue from those people. A ten-year campaign to get people to actually read the books they had paid so handsomely for ultimately failed. Mike Rinder writes of a campaign to get “50,000 Basics Completions,” which still hasn’t reached its goals. Even with only perhaps 15,000 active Scientologists in the world, each would have had to read three of the books in the series over a decade in order for the goal to have been reached, a campaign that continues to fall far short. In that regard, Scientology’s punctuation-driven business is an abject failure, because members got no value in terms of practicing cult dogma, which would have aided in customer retention. The poor participation in the campaign to get people to actually read their expensive books shows just how little actual Scientology is getting done among Scientology members today, showing just how vulnerable the cult is over the long term. This punctuation paranoia embodies a feature of virtually all cults. The paradox of selling the extraordinary power of the belief set while at the same time making members afraid of even the least little deviation from doctrine is a key to keeping members stuck and dependent on the cult for clarity and certainty in their lives. Thus, just as in the case of Nxivm’s banal punctuation classes dressed up as all-powerful received wisdom, Scientology’s discovery of a wholesale punctuation disaster is just another way of keeping people stuck. As feeble as it seems to outsiders, within the confines of the thought stopping program imposed by the group, punctuation can become a powerful tool for behavioral control. In other words, cults that have established a successful thought reform program are able to sell any content to members because they have been taught to be able to ignore their doubts about the value of what they’re doing. Groups can charge Ivy League tuition rates for 8th grade punctuation exercises because members are unable to bring to bear their innate common sense to question the viability of what’s transpiring. This ability to sell almost anything to the faithful is, in our view, going to be a key feature of next-generation cults that we see emerging rapidly with gurus who have learned to harness social media power far more capably than Scientology. These next-generation cult leaders recycle a collection of easily-created materials via a sort of cosmic cut-and-paste operation and serve it up to their subscribers. While most people look at a single video, see the flaws and move on immediately, enough get hooked that they become recruits, and the cycle of selling ludicrous dogma to the deceived begins again. 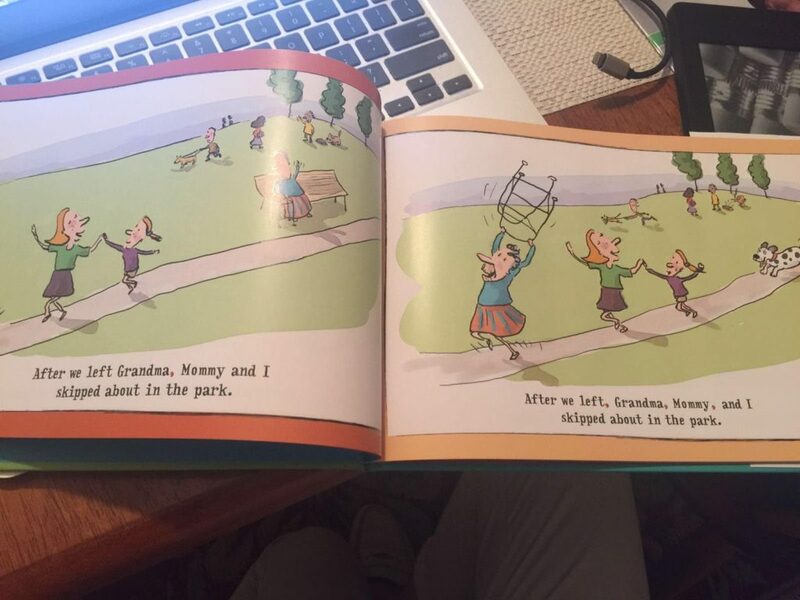 Nxivm founder Keith Raniere started an indoctrination camp for kids of all ages, ostensibly to turn out “super kids” by teaching them a different language each day of the week. We described the “Rainbow Cultural Garden” business several weeks ago, comparing it to Scientology’s “study tech” and musing about why cults often feel compelled to come up with some sort of odd educational program for children. Clearly, Rainbow Cultural Garden was a way to retain cult members by involving their kids in a long-term project that might hurt them if they left early without fully realizing the promised benefit of learning seven languages at an early age. Authorities closed down the Rainbow Cultural Garden operation in Miami because it was not licensed as a school or as a day care facility last week. Since states regulate day care and schools under US law, it’s not clear that the other Rainbow Cultural Garden operations in the US will necessarily be shuttered.